Breastfeeding and the 24/7 economy: can evenings play a unique role? Making it easier for women to get back to work after having children has been the ambition of successive UK Governments. A £5m career break returner scheme was launched in the budget just a few weeks ago, with the Prime Minister telling the parenting website Mumsnet that it was neither fair nor did it make economic sense, for women trying to get back into the workplace to find the doors closed to them. At the same time, the Government has acknowledged the considerable benefits to babies and mums of being breastfed. So what does this drive to get mums back to work mean for them, particularly if their job isn’t a standard 9-5 Monday to Friday affair? Afshin Zilanawala from the ESRC International Centre for Lifecourse Studies has been looking at what working evenings, nights or weekends might mean for mums and children when it comes to breastfeeding to see if this should be factored into our thinking around helping women back to work. In the last 50 years or so, many more women with children have gone back to work after having their children. The same time period has seen a huge growth in the service sector and it is these two economic changes, which have been credited to the growing phenomenon of nonstandard work i.e working evenings, nights, or weekend shifts. A 2008 report showed that nearly a third of UK employees work evening, night or rotating shifts and that 1/5 work on the weekends. About a quarter of employed mothers work evenings, nights, or rotating shifts and about 18% of these mothers work on the weekends. In that time, anecdotal information around the benefits and importance of breastfeeding to a child’s early development and mother’s mental and physical health have been supported by an ever growing and increasingly compelling body of evidence. In short, children who are breastfed develop physically and mentally more quickly and are less likely to develop infections or be obese, whilst mums are less likely to suffer post natal depression or develop breast/ovarian cancer. Given all that, it would be useful for policy makers and parents to better understand whether any particular work patterns or schedules are more or less associated with women breastfeeding and for us all to get to grips with how working nonstandard hours may complicate work and family life, and may constrain time with children that relates to their health and development. That’s where this research comes in. Dual potential: opportunities or costs? When I set out to look at this, it wasn’t easy to imagine a straightforward answer to this question of say whether working evening shifts might be more or less associated with a mum having started to breast feed or how long she breastfed compared with someone who worked weekends. There seemed to be a dual potential for each shift to make it harder or easier depending on how you looked at it. Evening or night work might make it difficult to schedule consistent breastfeeding patterns. However, at the same time, these shifts might allow for dad or another caregiver to supply pumped milk if a mum is working odd hours. Using information collected as part of the Millennium Cohort Study, which has followed the lives of children born at the turn of the century, we were able to look at more than 17,000 mothers and their children. Mums were asked if they had ever tried to breastfeed and, if so, for how long. From this and informed by the UK infant feeding guidelines at the time of the survey, which recommended exclusive breastfeeding for 4–6 months, we were able to create 2 month bands for different breastfeeding duration e.g. ‘intermediate’ (terminated breastfeeding after 2 months but before 4 months). 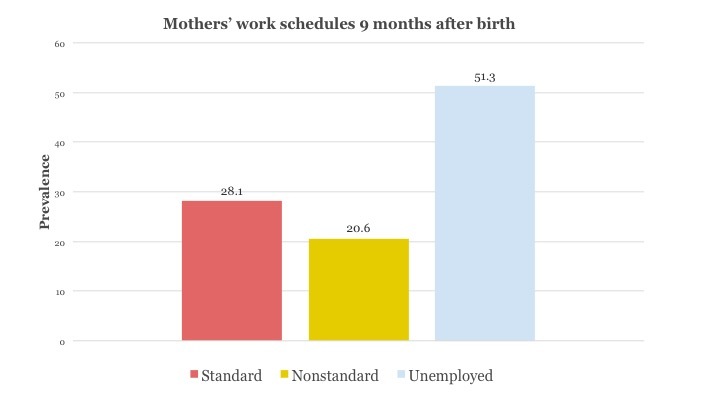 When their babies were 9 months old, mothers who were working provided information about the sorts of shifts they worked and how often they worked them. Nearly 70 per cent of mothers breastfed their child. Thirty percent of them stopped breastfeeding before 2 months and one-third breastfed for at least 4 months. 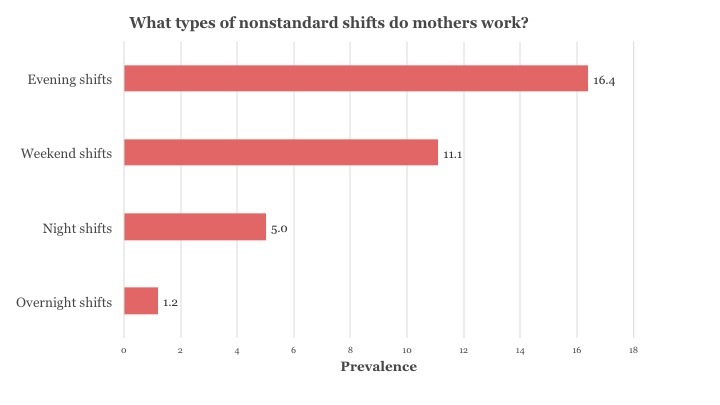 About half of mothers were not working at the time of the survey, nearly 30 per cent were working a standard shift and one in five was working nonstandard shifts. Looking more closely at nonstandard work, it was possible to see the prevalence of the different types of shifts. An interesting thing to emerge when we looked just at work patterns and breastfeeding was that women who worked evenings were 70 per cent more likely than women who were unemployed to have breastfed at all. They were also more likely to breastfeed than women who worked other non standard shift patterns i.e. night or weekend shifts. Women who worked evening shifts were also more likely than their unemployed counterparts to continue breastfeeding across all the different ‘duration bands’ including the longest. They were still also more likely than their peers doing other non standard patterns of work to be breastfeeding i.e. night, weekend and overnight shifts. So what is it about evening work that appears to be ‘compatible’ with starting and continuing to breast feed (or vice versa?) Perhaps mothers working evening shifts have positive breastfeeding experiences and so keep on breastfeeding and working. Perhaps supportive and flexible working arrangements influence the decision to breastfeed for longer. Evening schedules perhaps have a less disruptive effect on sleep patterns than irregular or night shifts, leaving women feeling more able to manage a job and caring for/breastfeeding their children. So perhaps evening work schedules have something of a unique role to play in child and maternal health when it comes to helping women back to work without losing the many benefits for them and their children of breastfeeding. There’s a lot more that needs disentangling here, but, nevertheless, food for thought! Maternal Nonstandard Work Schedules and Breastfeeding Behaviors is research by Afshin Zilanawala and is published in the Maternal and Child Health Journal. This entry was posted in Journal article and tagged Breastfeeding, Career, Childcare, Employment, Equality, Family, Flexible working, Health, Jobseekers, Mental health, Millennium Cohort Study, Mothers, Well-being, Work on November 7, 2017 by Chris Garrington. A secure, comfortable and healthy retirement is something most of us aspire to. But, as we live longer, we are all being encouraged to work later, increasingly well into our late 60s, so what might that mean for those aspirations, particularly the desire to be fit and healthy? Whilst the number crunchers have done their homework about how the sums add up around the available money to support more retired people for longer, very little is known about how working longer will impact on our health and what the knock on personal, societal and economic costs of that might be. Peggy McDonough at the University of Toronto, together with colleagues at UCL and Kings College, has been using US data to get a clearer picture of what the latter part of working life and health look like for men and women. Here she explains the research and why flexible working policies, particularly those concerning part-time work, could be key to ensuring a healthy retirement is a reality as well as an aspiration. Across the developed world falling birth rates and the so-called ‘baby-boom’ cohort’s retirement have raised the spectre of unsustainable State pension costs. This has led to a range of reforms, many of which have seen a rise in the age at which we can collect State Pension. In the UK in 2020, men and women will have to wait till they are 66; this will rise to 68 by 2028. In the States, the age will be 67 in 2027. In addition, other incentives to work longer and disincentives to take our pensions earlier have been trialled or introduced. What we don’t know much about is what the health consequences are of stepping up the workplace participation of older adults. Will working longer make our health better or worse? And what if those consequences undermine other social and economic goals, such as those around wellbeing and inequality? In addition, are there differences in the way these things play out for women and men? Research to date has tended to focus on retirement as an exact or single point in time, which doesn’t necessarily reflect the more complex things happening during the run up to and after retirement. Findings are also ambiguous and it’s not clear whether retiring early, partial retirement or working longer is generally associated with better health. Our research looks across a much longer period, viewing retirement more as a project that unfolds over time and drilling down into what is going on as we move from the ‘family- and career-building years’ to the ‘frailty years of old age’. This way we hope to get a better and more nuanced picture of how our work and our health interact over this part of our life and get some pointers about what seems to work best when it comes to staying as healthy as possible into the Third Age. Our data come from the Health and Retirement Study, which has collected information from more than 25,000 Americans aged 50 + since 1992. Working with the original cohort, all of whom were born between 1931-41, we examined the working lives and health of some 6,500 men and women over 18 years. It was interesting to see that only 14 per cent of the men in our study followed a ‘conventional’ path involving full-time work until retirement at around 65 years of age. More of them (21 per cent) acted in line with recent policy initiatives and worked longer or did the complete opposite and retired in their early 60s (18 per cent). Slightly less than one in ten men stayed working but shifted from full to part-time work; it was rare for men to have had a substantial period of the time in part-time work. Less than half as many women (10 per cent) worked full-time throughout the period. They were three times more likely than the men in the study to have worked part-time from the outset. The largest proportion, double that for men, was not working across this period, but, if they were, they were more likely to retire around the age of 62 than 65. When we took into consideration a range of other background factors, like education, income, marital status, and minority background, we could start to get a picture of the most ‘advantaged’ people in terms of health. One group of men stood out: those who downshifted from full-time to part-time work around age 65 had the lowest chance of being in poor health at age 70. Women were slightly different: being in work (either part-time or full-time) was associated with the best health, as was retiring in the early to mid 60s. Women in long-term part-time work were especially advantaged. At the other end of the spectrum, men retired early or worked very little in middle age were more likely to have poor health than others. The same was true for women. 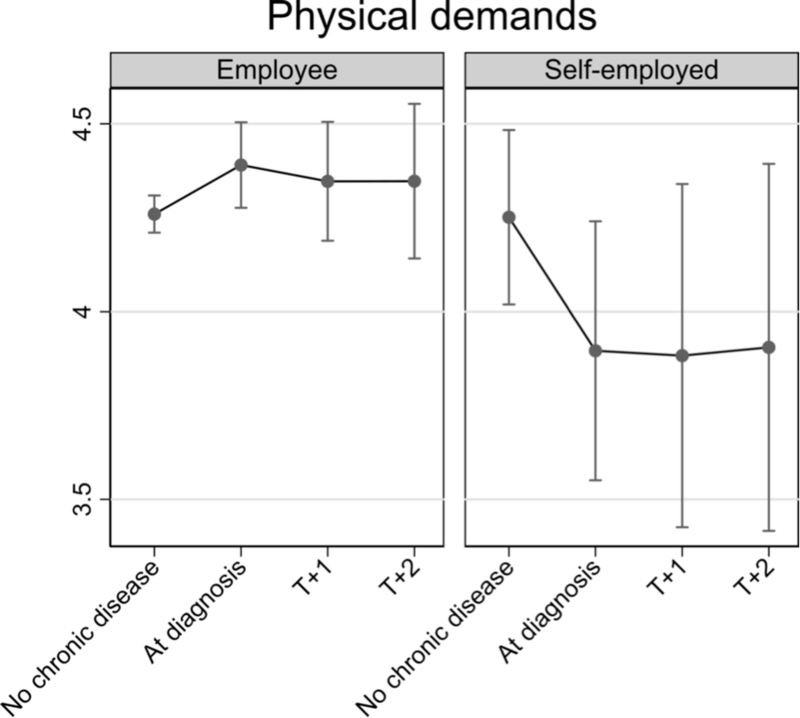 Whilst it was interesting to note that long-term part-time work for men was not linked with better health for men when it was for women, we think that is probably because for this generation, women (traditionally caregiver) would have perhaps engaged in part-time work through choice, whilst for men (traditionally breadwinner) the reason may have been linked to earlier poor health. Our research certainly provides a more detailed picture of how people’s working lives pan out in their fifties and sixties and shows quite clearly that men who are able to shift to part-time work in their 60s are most likely to have better health in their 70s whilst for women a long-term part-time arrangement seems to reap the most health benefits. In short, it seems there may be considerable health benefits to part-time work but in ways that play out slightly differently for men and women. It should provoke interesting discussions among employers, unions, policy makers in the areas of employment and health and, of course workers themselves as they think about the sort of retirement they want and the options they have (or don’t have) when it comes to flexible working. Given that less than 10 per cent of men and less than 5 per cent of women in our study followed these ‘optimum’ pathways for better health in their 70s, it’s an area that could serve as a real focus in the coming months, preferably before the pension reforms outlined earlier come into force. 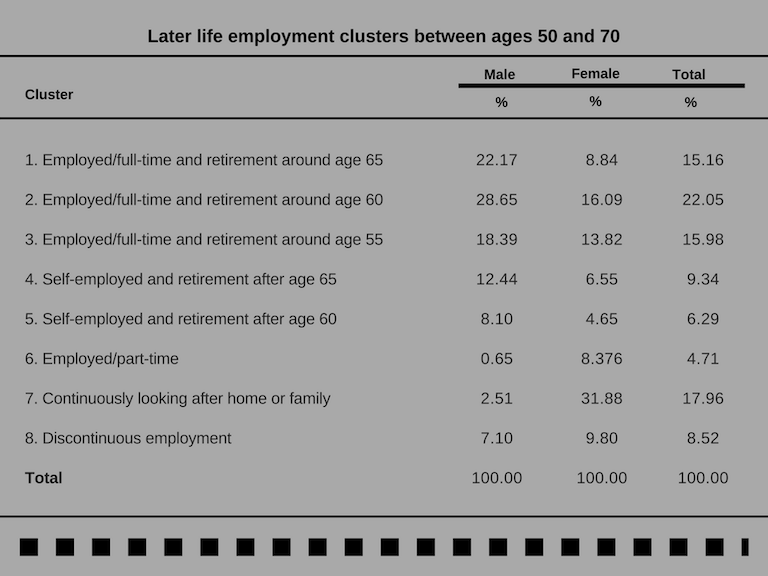 Later-life employment trajectories and health is research by Peggy McDonough, Diana Worts, Laurie M. Corna, Anne McMunn, and Amanda Sacker and is published in the journal, Advances in Life Course Research. This entry was posted in Journal article and tagged Ageing, Career, Disability, Employment, Flexible working, Health, Health and retirement Study, Pension, State Pension Age, Unemployment, Well-being, Work on October 5, 2017 by Chris Garrington.